Ever since my girlfriend Belén and I visited the Lofoten Islands in northern Norway on our bikes in the summer of 2017, we’ve fallen in love with these beautifully diverse, spectacular islands and their nature, people and unique outdoor infrastructure. The Norwegians take being outside more seriously than anyone else…! So, in honour of our love for this place, we’re excited to announce our very first photography workshop. Will you join us for an epic northern light-filled trip that’ll make you fall in love with this place as much as us? Read further to let us convince you! Payment by PayPal: +3,6% fee. Day hike to Munbeku hut and if conditions allow for it, Munken. Slow drive towards Fredvang with stops at the most iconic beaches and classic Norwegian rorbu. We get to roam around a ‘hidden’ beach called Bunes and look for the abandoned cabin. Early wake up call & breakfast to then catch the ferry back to Bodø. From there you can fly back home… or somewhere else in Norway! 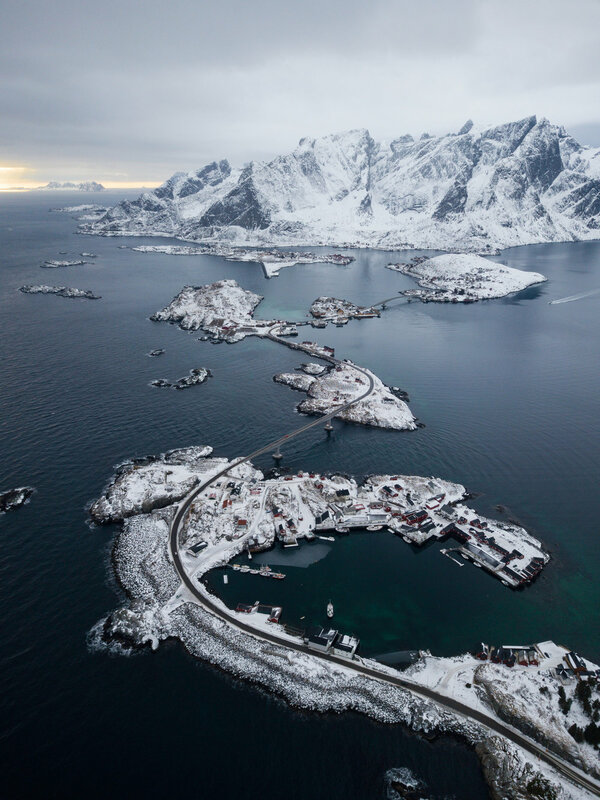 The Lofoten Islands are located in the Artic Circle but thanks to the warm Gulf Stream the temperatures are not as harsh. Expect temperatures during the day to be close to 0°C and around -5°C at night. Actually, clear skies usually mean colder temperatures but also a great opportunity to see the northern lights! Wide angle lens for landscapes (anything ranging from 14mm – 34mm full frame) ; standard zoom (24-70mm). Potentially a tele-zoom (150mm +) if you have one. Comfortable clothing with several layers (dress like an onion, layer by layer). If you’re getting cold, put on another layer. If you’re getting warm, take one off. Merino wool layer (or substitute) is recommended. This trip is recommended for active people as we will be hiking/walking on the snow every day for a few hours. We will be able to use crampons to help us on the snow and walking sticks for who might need them. The cool thing about this is that we will probably be alone on every single hike as other tours and tourists barely leave their parking spot. But remember that the hiking trips will fully depend on the weather conditions. 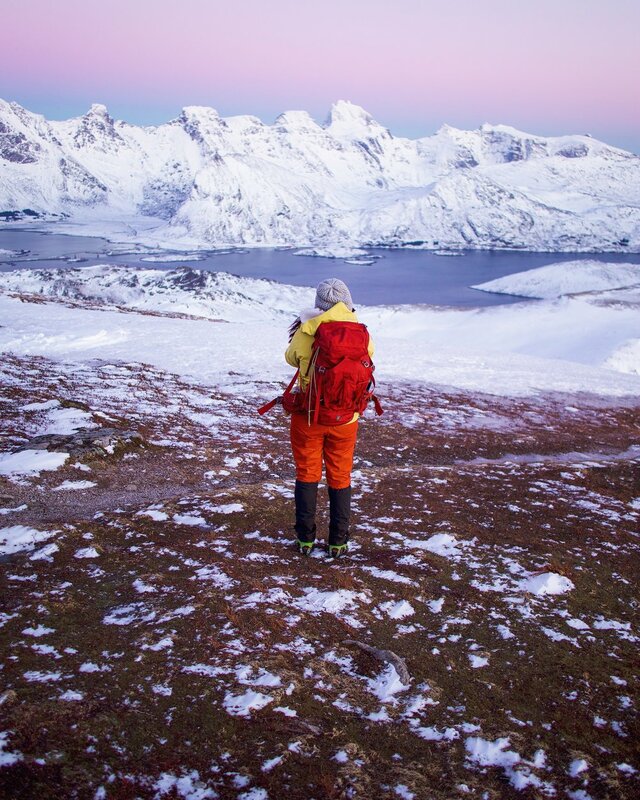 Weather in the Lofoten Islands can be unpredictable and rough, which means we can’t guarantee we will be able to do all the hikes as conditions could be dangerous and our safety at risk. 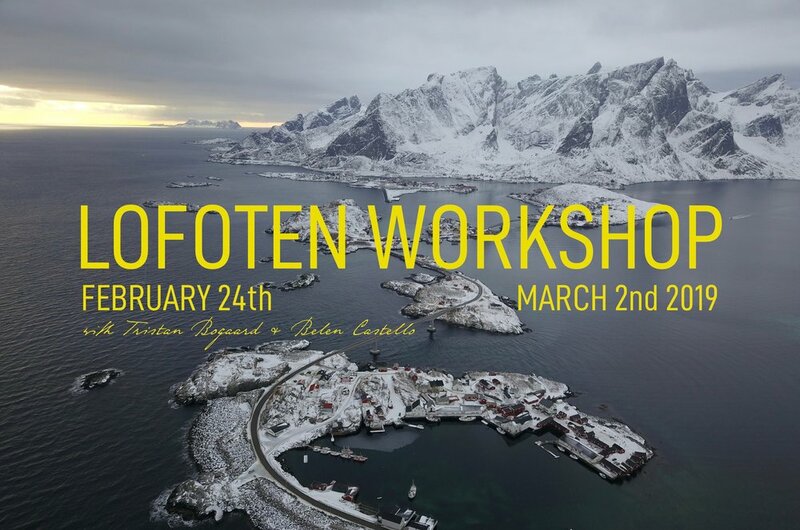 Also, the Lofoten Islands are one of the best located places in the world to see the northern lights, but it is never guaranteed, we need cloud-free skies and solar activity to see them, so keep that in mind and let’s hope we get lucky! We ask for the payment in full 80 days prior to the workshop starting date (December 6th, 2018 at the latest). Those purchasing through the special promo price (1400€) accept a non refundable cancelation term at any given time. READY TO LEARN, LAUGH, MAKE NEW FRIENDS AND SEE THE MOST REMARKABLE NATURAL SPECTACLES?